True love weaves two hearts together so tightly that nothing can tear them apart. This pair is the perfect picture of that type of unbreakable commitment and affection. Three strands of gleaming 14K white gold twist in harmony into three interlocking loops in these love knot earrings, symbolizing unity and a bond that will never be broken, not matter what. They also represent a love that has no end through their continual, gracefully-curling loops. Inspired by a centuries-old Celtic knot, this pair holds a powerful message of togetherness and has style that will never run out. Earrings are 8mm and have standard push-back posts. 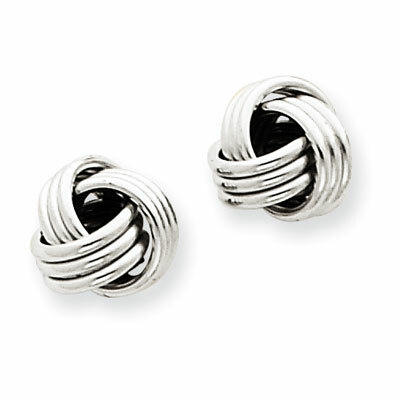 We guarantee our 14K White Gold Basketweave Knot Earrings to be high quality, authentic jewelry, as described above.